This script is an add-on for Event Trigger Labels. It allows you to assign key items as trigger labels, allowing you to use key items to trigger events. You can add multiple key item triggers to an event, each with their own set of responses. By pressing a button of your choice, the player can bring up a key item selection window that will list all of the key items currently in the inventory. The player can then select a key item, and any events in front of the player that can be triggered by the item will execute. 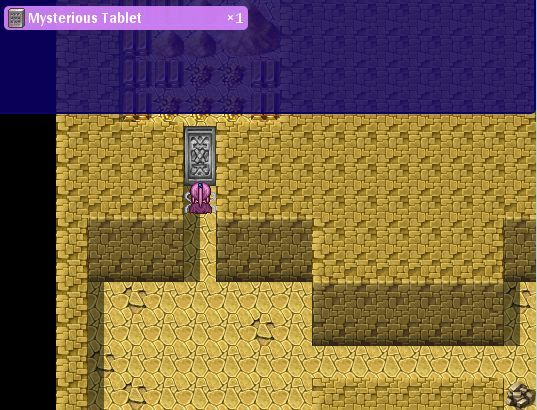 Rather than creating static events that will ask you whether you wish to use a certain item, or simply check whether the item is in the inventory and proceed to run the appropriate logic, you can challenge the player to figure out when and where an item should be used. Instead of treating your page as one list of commands, you should instead treat it as different sections of commands. Each section will have its own label, specified in a specific format. Where the ID is the ID of the item that you want this trigger label to respond to. To set up your items for use as key items, in the item tab of the database, create an item, set the item type to “Key Item”. You can have it so that you will consume one key item when you successfully trigger an event. Simply set the item’s consumable option to “Yes”. If you don’t want the item to be consumed, set it to “No”. Sometimes you simply want the event to respond to a key item regardless what the key item is. You can use a special “ANY keyitem” trigger label which will be run if the event has no matching key item label for the key item you used. Hi, I have a question. Is there a way to call the Key Items menu without making the player press S? What I want to do is make the window open by autorun, then make the player choose one item or another. Then, the scene will run differently depending on what button they press. I believe you can just use the “Show Key Item selection” event command normally. Is there a way to use the item from the default menu instead of your own? I don’t want something like the Select Key Item command where it forcibly opens the menu and makes you choose. I want the player to choose to use an item by himself. This script allows the player to press a specific key to open the select key item menu themselves. Yes, but I don’t want to use that function. Instead of pressing a key to open the key item menu, I want the player to go to through the default menu (Which is open with B button by default) and go to the Items -> Key items Menu. Is there a way to have an event bring up a window to choose a Key Item from? Yes, when you create your event there is a command called “Select Key Item” on the first page. However, that approach does not trigger my script, so you would need to use conditional branch and check the variable manually instead of using labels. Thank you, I can’t believe I never noticed that… but still, this script will be useful for other things! Thanks for very useful script! Can I somehow show specific message when player trying to use key item on nothing? You will need to update event trigger labels and key item trigger labels to use it.